Best US Cyclo-Cross Racer of All Time? This entry was posted in Racing on January 31, 2007 by Steve Tilford. 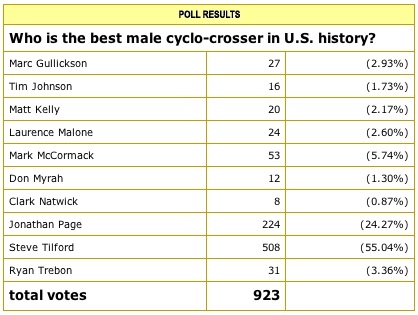 They posted the poll the day after Jonathan Page had nearly just won the Cyclocross Worlds. Prior to the event, it was inconceivable that an American rider would be able to compete at that level. From my perspective, his result is the most astonishing cycling accomplishment in USA Cycling history. You have to realize how fast those guys are going and how much depth Belgians have in their Elite Team. OK, back to the poll. I won the poll by a large margin. I’m not sure if there is anything that you can read from the results of a poll like this. I’m not sure it’s accurate, but polls, especially subjective polls, are always suspect. Maybe it’s just a popularity contest. But, Velonews is the most prestigious US cycling industry publication, so it’s readers are knowledgable (I hope!). A very big compliment no matter what you think. Anyway, thanks to everyone that voted for me. It’s nice to be recognized by your peers.